Drivers who are in search of automotive thrills are no stranger to the athletic and fun-to-drive Mazda MX-5 Miata. An iconic, two-seater convertible coupe, the Mazda MX-5 Miata prides itself on an athletic performance with an affordable price tag and that stellar reputation gets a boost with the debut of the 2019 Mazda MX-5 Miata in Las Vegas, NV. Armed with a more powerful engine and a wealth of innovative features, the updated Mazda Miata is more attractive than ever! Expected to arrive at Earnhardt Mazda Las Vegas in the fall of 2018, the 2019 Mazda MX-5 Miata will be available in three performance-tuned grades – Sport, Club and Grand Touring – that can be tailored to fit your specifications. If you prefer the style of a hard-top convertible, the 2019 Mazda MX-5 Miata RF is set to arrive in August 2018 and will be available in two grades – Club and Grand Touring – with a price that starts at $32,345. What's New for the 2019 Mazda MX-5 Miata Design at Earnhardt Mazda Las Vegas? Are you looking for a one-of-a-kind, performance-tuned ride? 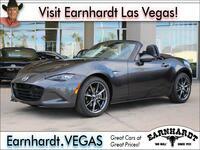 Look no further than the 2019 Mazda MX-5 Miata in Las Vegas, NV. Armed with a more powerful 181-horsepower 2.0-liter SKYACTIV®-G four-cylinder engine that makes 151 pound-feet of torque, the Mazda MX-5 Miata will take performance to another level. With this powertrain under the hood, the Mazda Miata will increase power by 17 percent and will improve fuel-economy numbers. Engine upgrades will include lightweight pistons, a dual-mass flywheel, a dynamic exhaust system and an upgraded final drive ratio with the six-speed SKYACTIV®-Drive automatic transmission. Exterior upgrades to the Mazda MX-5 Miata design include an all-new brown soft convertible top, black 17-inch alloy wheels, easy-open doors and updated door stops. Inside the 2019 Mazda MX-5 Miata cockpit, you will enjoy a wealth of exceptional features and technology that put more focus on safety. Mazda Miata entries will come standard with a rearview camera and will be available with Traffic Sign Recognition and Smart City Brake Support. More innovative i-ACTIVSENSE® safety technologies will be available for Mazda MX-5 Miata models to upgrade safety and a MAZDA CONNECT™ touchscreen infotainment system comes standard to keep you connected no matter where your next adventure may take you. 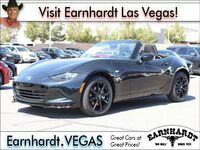 Visit Earnhardt Mazda Las Vegas in the heart of Sin City this fall and get behind the wheel of the performance-tuned 2019 Mazda MX-5 Miata!